The simplest method of roasting a turkey breast in the oven. Crispy skin and moist, tender meat. A quick sauce made with the roasting juices and you’re done. After roasting the turkey drumsticks last week, it was the breast’s turn in the oven. I still had a nice frozen turkey breast belonging to the last turkey I bought from a farm in our village, a nice and large turkey breast with its skin still on. Normally, supermarket turkey breasts have all their skin removed and although generally I cannot say that’s such a bad thing (the calories…), I still have to admit that I do love to munch on that super crispy, salty and delicious skin from time to time. Turkey breast sizes can differ very much from bird to bird. I usually roast only a half-breast, it is more than enough for our family. It normally weighs between 1,2 and 1,7 kg/ 2.6 – 3.7 lbs. When defrosting turkey parts always do that in the fridge. Allow at least 10 hours in the fridge for a turkey breast, more for larger pieces. Take the meat out the fridge about one hour before you start cooking and allow it to come to room temperature. Start checking the internal temperature of the meat about 1 hour after starting the cooking process (depending on the size of the piece of meat) and continue checking regularly until the meat reaches the required internal temperature. Rest the turkey breast for about 10-15 minutes before slicing it. 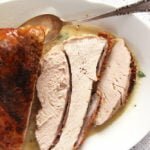 This is the simplest way I have ever found to roast turkey breast. I mean, roasting a piece of meat is not particularly difficult, still you have to take care not to overcook the meat, for me that’s the biggest challenge. I always worry about serving unsafe food to my family (especially when it comes to poultry) and it does happen that from sheer fear of serving raw poultry I end up having a dry roast. and taking the time to search about the internal temperature of various types of meat. When it comes to turkey I found this site United States Department of Agriculture – Food Safety and Inspection Service to be very useful. 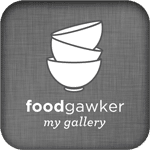 They provide quite detailed information not only regarding the above-mentioned internal temperature of properly cooked turkey, but also information on thawing and roasting a turkey or turkey parts, including timetables and other cooking tips. So, if you do not own a meat thermometer yet and don’t intend buying one, those timetables on roasting the meat can still be very useful. But for me the main beauty of using the thermometer is that I don’t have to calculate different cooking times when it comes to different bird parts weighing more or less than what a particular recipe states. 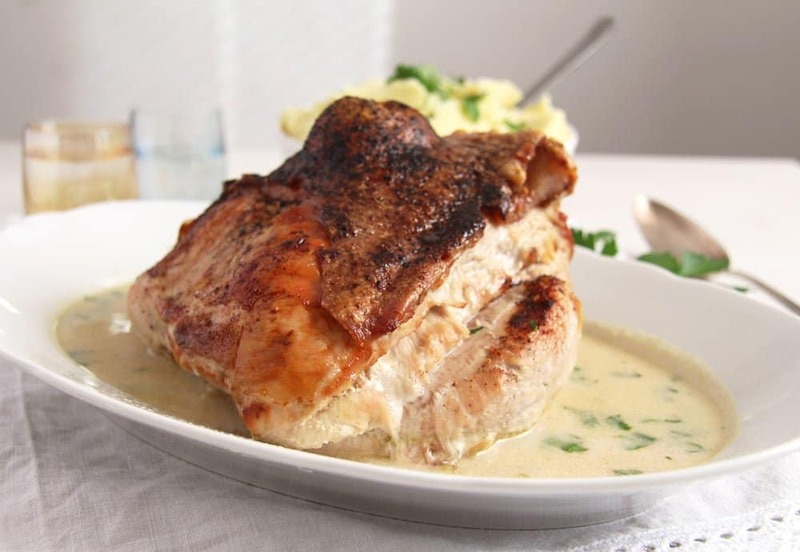 You see, the standard recipe talks about a turkey breast weighing for instance 1,2 kg/ 2.1 lbs. So my problem is that the breasts I get weigh maybe only 900 g/ 1.15 lbs or maybe 1,6 kg/ 3.8 lbs. I was never sure about the necessary cooking time, so I would always google and calculate and so on. A meat thermometer makes things much easier. When the required inner temperature is reached, I end up the process being sure of eating safe yet still moist and juicy meat. It could not be any easier. According to the FSIS mentioned above, the required internal temperature of cooked turkey is 73 degrees Celsius/ 165 degrees Fahrenheit. My turkey breast weighed about 1,5 kg/ 3,5 lbs and I needed a total roasting time of 1 hour and 30 minutes by 180 degrees Celsius/ 360 degrees Fahrenheit, temperature which was lowered to 75 degrees Celsius/ 167 degrees Fahrenheit to finish the cooking process. Of course, the cooking time depends on your oven as well, not all ovens are top when it comes to the exact temperature. You kind of get to know your oven and adjust times accordingly. If you don’t use a meat thermometer, check the meat after about 1 hour and 10 minutes by inserting a long stick in the thickest part of the breast. The juices should run clear, if they are still red or pink continue the cooking process checking again every 5 minutes or so. I used only chicken stock to roast the turkey breast, you could either mix that with some wine, use only wine or only water, if you wish. I rubbed the breast with only paprika powder, salt and pepper, but you could use any spices you like, for instance curry mixtures or other Indian spices, anything you like actually. I added only onions and garlic to the roasting pan, but you could enrich the dish with some carrots, parsnips, peppers and so on. When making the sauce, puree all or only some of these vegetables and serve the rest of them on the side. I thickened and enriched the sauce with smetana, but you could use heavy cream or sour cream instead or you can leave these milk products out of the equation. The sauce is delicious even if you do not add any milk products. In case the sauce is too thin, you can thicken it with some corn starch. 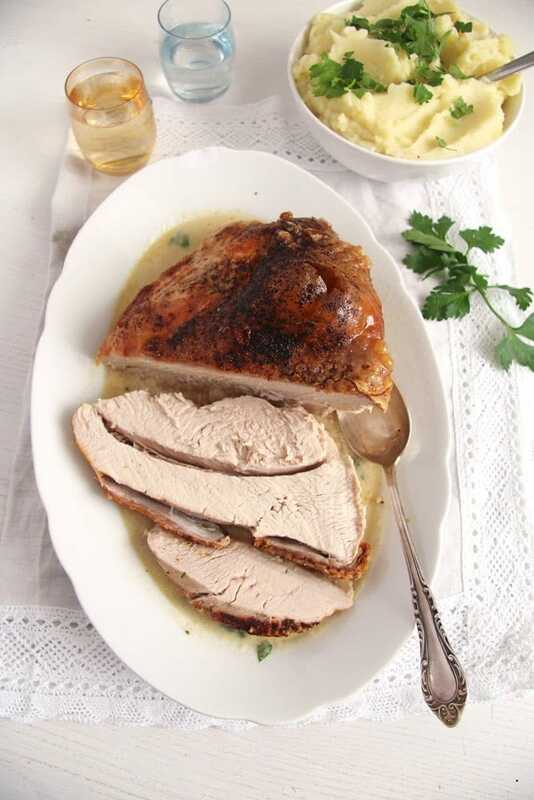 Serve the Tender Oven-Roasted Turkey Breast with potatoes in any form you like (we had mashed potatoes last time) and vegetables or salad of choice. Rub the chicken breast with sweet paprika powder, salt and pepper all over. Give the chicken stock to a roasting pan. Give the roughly chopped onion and the garlic cloves to the pan as well. Place the turkey breast on top of the vegetables. 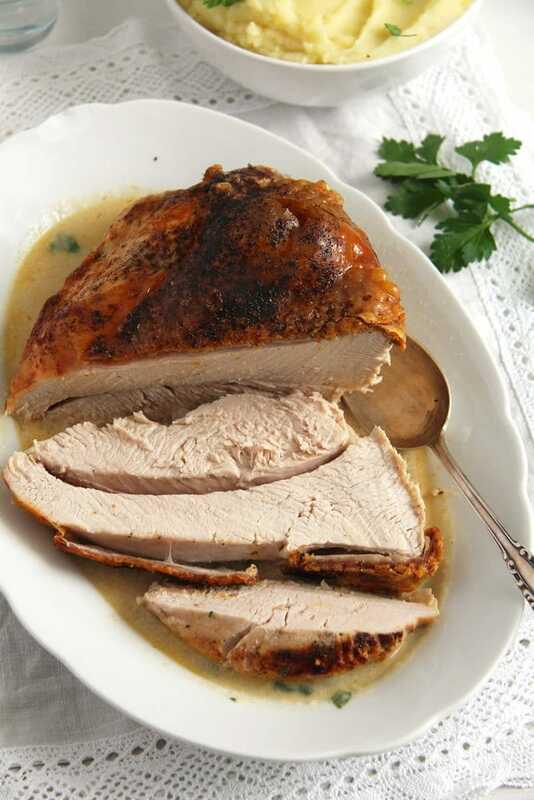 Roast the turkey breast until the internal temperature reaches 70 degrees Celsius/ 158 degrees Fahrenheit. 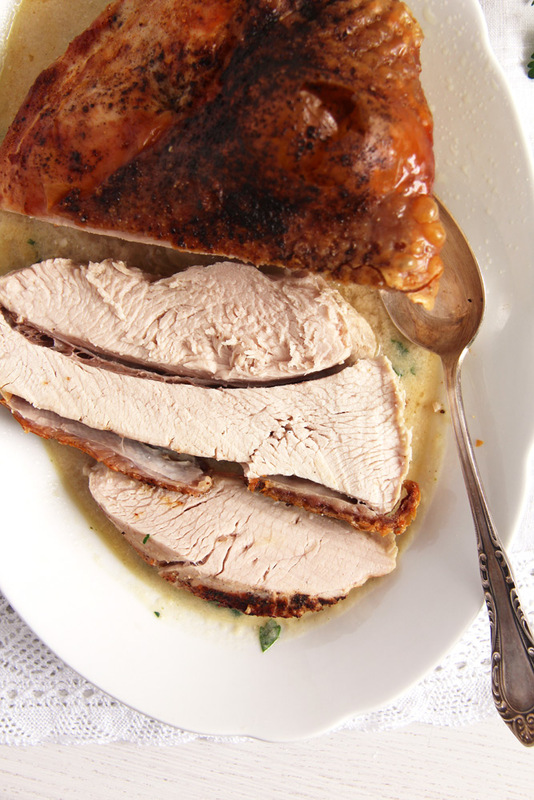 Don't forget to baste the turkey breast with the pan juices from time to time. Open the oven shortly to allow the heat to come out, close it again and lower the oven temperature to 75 degrees Celsius/ 167 degrees Fahrenheit. Leave the turkey breast inside until its internal temperature reaches 73 degrees Celsius/ 165 degrees Fahrenheit. If you don't use a meat thermometer, start checking the meat after about 1 hour cooking time. Insert a long thin stick in the thickest part of the turkey breast, when the meat is done the juices should run clear. If they are still red or pink continue cooking the turkey, checking repeatedly about every 5 minutes or so until the juices run clear. I needed about 1 hour and 30 minutes until the turkey was done. 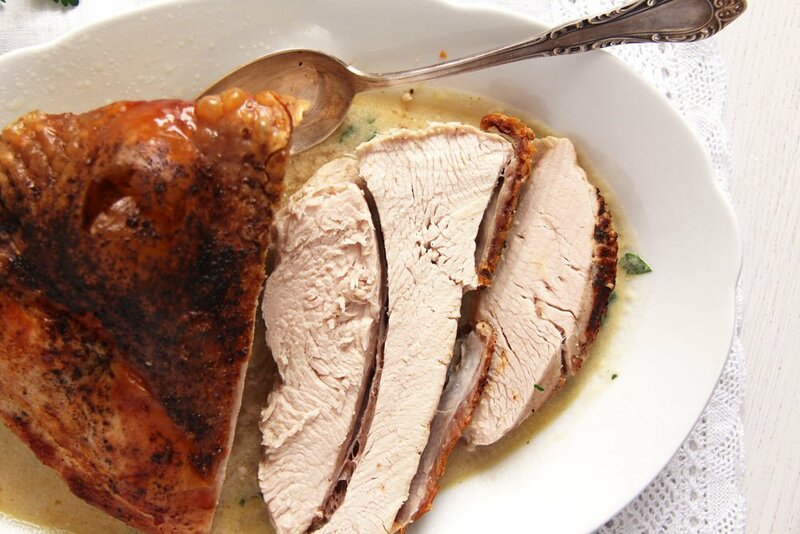 Take the turkey breast out of the roasting pan and place it on a warm serving dish. Let rest for about 10-15 minutes before slicing it. To make the sauce give the roasting pan contents to a small saucepan. Puree the onion and the garlic cloves. Bring the sauce to a simmer and whisk in the smetana. Adjust the taste with salt and pepper, but only if necessary. Chop the parsley and give most of it to the sauce. Sprinkle the rest on top and serve the roast with the sauce, potatoes and vegetables or salad.